A screenshot of game’s main screen. For $13, the recently released Wii U game A Day At The Carnival doesn’t give you much. 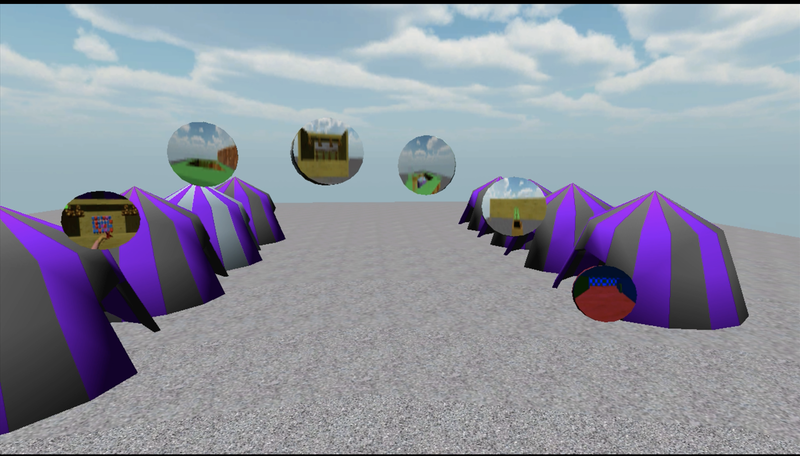 The mini-game collection takes place in a desolate wasteland, with nothing to be seen except gravel, sky, and oddly colored tents. Sound will only come from the Wii U controller’s speakers. Sometimes, its graphics don’t fit on the screen. If you decide to play skeeball, good luck figuring out how to aim. If you throw the ball, you can’t even see where it lands. Who makes a game like this? The credits trace the game back to Thornbury Software, the founder of which is Robert Thornbury, a 59-year-old former factory worker in Winchester, Indiana who says he used to work 22-hour days between the factory and making games. A Day At The Carnival is what it is, he argues, because it is for kids. By earning enough points in the games, you can win teddy bears. It’s not inherently clear why targeting games to children would excuse some of the problems in A Day At The Carnival, but Robert Thornbury is clear that he’s probably not making games for me or you. While making another of his games, 2016’s Call of the West, he said he was approached by people he knew in Winchester. A lot of whom had grandchildren, and they wanted him to make games suitable for the whole family to enjoy. You can, in fact, beat the skeeball and dart throwing games in A Day at the Carnival quite easily. As long as you aim in the general direction and press the throwing button, you’re sure to score some points. He says that his neighbors have responded positively to his games. The game does have at least one fan there. On Nintendo’s social media service Miiverse, someone called AppleFun! excitedly shares their scores with other players. A checkmark on their post indicates they actually own the game. User AppleFun! posted this journal in the game’s Wii U community. However, on that same service, other users are much more negative. They’ve called it a “pile of trash” and “awful,” among other things. One user comments that he would prefer to give 13 dollars to another person rather than spend 13 dollars on A Day at the Carnival. Another user expresses disdain for the graphics in A Day at the Carnival. Because of all the negative comments that he received about his game online, Thornbury attempted to change the description for the game on Nintendo’s website to establish that Carnival was geared towards children. The company has not changed the description. Thornbury says he thinks they won’t change it either because they like the controversy, or maybe because they are busy. 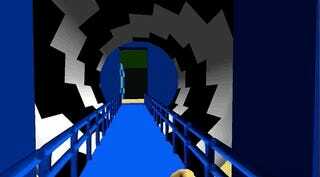 In this minigame, you walk through a tunnel that shakes, rattles, and rolls. Some makers of bad games come off as greedy charlatans trying to make a quick buck, others like dreamers who can’t turn their ambitions into compelling reality. Thornbury seems different. When we spoke, he sounded earnest but overwhelmed, remarking that his company can’t compete with giants like Naughty Dog and Microsoft. His creations aren’t innovative, but focus on the desire to serve up some nostalgic pleasures by making games about archery and carnivals. When he talks about the games he has made or hopes to make, he sounds like a man who got the passion to program long ago, but has had little time to get the training to meet modern expectations. You can see it in the screenshots on Thornbury Software’s website or in A Day At The Carnival as it runs sluggishly on the Wii U: these are games that look like they were built for Windows 95. Thornbury is unsure about exactly when he first learned to make games. But he says he remembers that that back when he was in school, he had to create a tic tac toe game, a chess game, and a checkers game. Thornbury says he developed his programming skills decades ago by working with DOS, and later with Windows. He launched Thornbury Software in 1992 after he wanted to market a checkers game that he wrote. These days, he programs the games, while his business partner, Tannis Stants, does the artwork and animation. The company’s first major game was 2016’s The Call of the West, which is available as a PC game. It’s about a girl named Abby who decides to explore the Wild West. The next three games, A Day at the Carnival, Archery, and Shooting Range were designed to be “quick and dirty games” to be played on the now-defunct Playstation Mobile. In this skeeball game, you’ll notice that the graphics are offscreen and that it’s relatively easy to win a teddy bear. However, you can’t see where the ball lands. Until recently, he wasn’t primarily a game developer. Over the years, he’s had to work factory jobs to make ends meet. He assembled locks for Honda hoods at a Marujun plant. Last year, after Marujun was bought out, he began working at a TOA factory, where he welded Subaru frames together. Thornbury estimated he worked 40 hours a week at the factory, and another 50 hours at Thornbury Software. Thornbury left his factory job a month ago. He says his company now employs six people and is profitable, though he declined to share any sales numbers. While his post-factory work schedule is better, he hasn’t really stopped working. Typically, he starts his morning around seven o’clock and checks emails and Facebook. He said that he keeps a notebook of things he has to do around the office. On the day I interviewed him, Thornbury said he had six pages worth of things to do. This week, they have a brainstorming session for future games. Now that Thornbury’s back to working with the company full time, they have big plans. They are remaking Call of the West, seeking investor help, and plan to start using the Unreal Engine. They’re also moving over to more grown-up games, and instead of doing a first-person shooter, they’re going to focus on third person shooters. Thornbury thinks that switching to content for older audiences will give them the ability to develop more complex storylines, and now that they have Unreal, they can make better graphics. Thornbury hopes people think his games are fun, or at least play his games and find themselves craving other stuff to play. You can check out the company’s full list of games here.